Decorative Panel in Wrought iron. 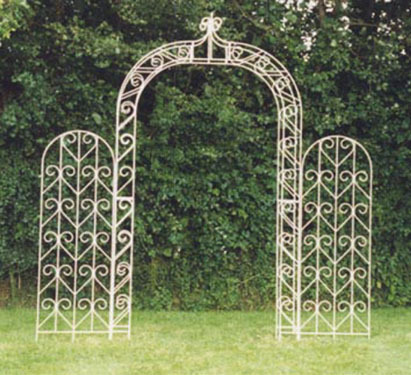 Pavilion Arch 48"/122cm opening-product code GF742W. Each panel has a height of 72"/183cm and a width of 23"/58cm. Each panel is attached to the Pavilion arch with 3 special joining kits (GF520). These special joining kits can also be used to join Decorative Panels to each other so that a screen of any length can be arranged. The Pavilion Arch shown has a Pointed Top and a 48"/122cm Opening- GF742. The extra cost of the Pointed Top is included in the prices below. In Etched Galvanised,Cream or White £ 425.70. There is a delivery charge based on the order value - See "How to Order" on Home Page.